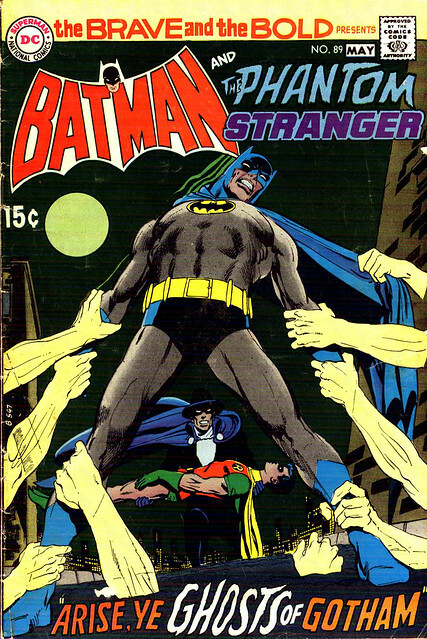 No other mainstream superhero has appeared in more spooky and tense covers than Batman. 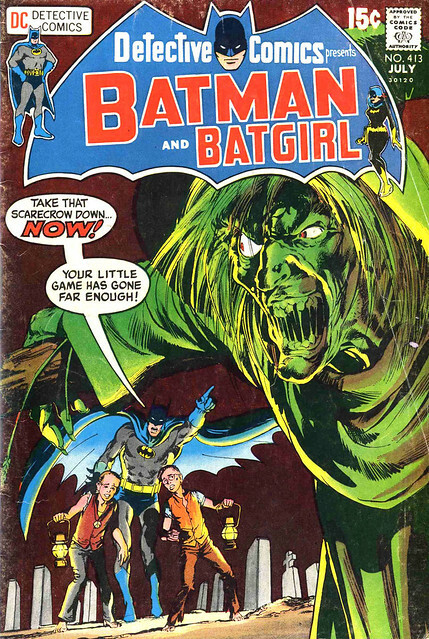 Neal Adams illustrated quite a number of them in the early 1970s. 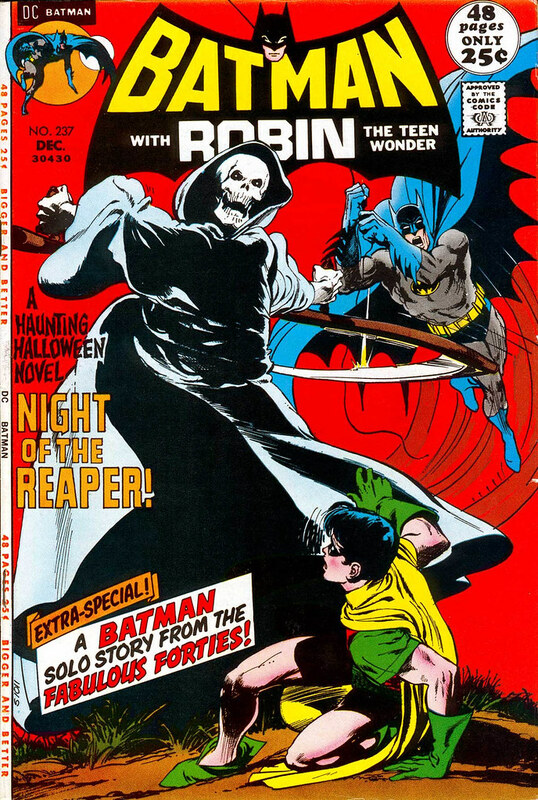 Batman #237, from 1971, featured the classic story "Night of the Reaper" that took place at the annual Halloween parade in Rutland, Vermont. This parade was featured in a few other comics, such as Marvel Feature #2 (featuring the Defenders). Comic Book Legends Revealed wrote a recent article about it. And there is another article featuring the plot here. The image of the Grim Reaper, dressed in white, about to cleave off Robin's head, made me a nervous wreck. The red background was quite alarming too! Confession: I never read either the House of Mystery or the House of Secrets. 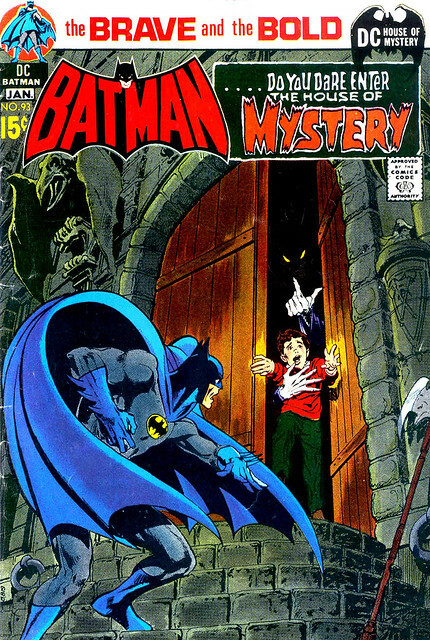 But when I saw the cover to Brave and Bold #93 featuring Batman and the House of Mystery, I had to buy it! That creepy cloaked figure taking the little boy in the house was just too much. The bigger mystery was how Batman was going to meet the character of an anthology title. They solved that by having Cain, the narrator of HoM, talk to the reader directly, commenting on all of Batman's actions. I did read the Phantom Stranger comic and for some reason loved it whenever he teamed up with Batman and the Justice League. Those ghostly arms weren't as weird as a comatose Robin in the Stranger's arms. Detective Comics #413 makes a good case for staying the hell away from Scarecrows, especially at night! You can see in these Adams DC Covers, over and over again, a theme of kids in jeopardy. It was used in other DC Comics silver age covers. The theory being, if you're a kid seeing the cover, you would identify with those youngsters. It won't work today--there are too few kids reading comics. Perhaps we should see middle aged men in terror of losing their homes? Nuff Said!